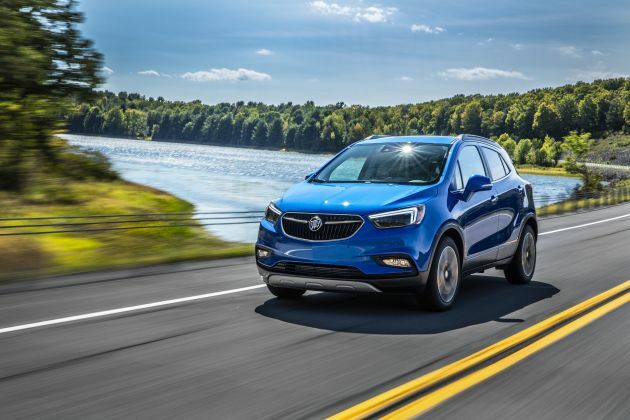 What changes will make the 2018 Buick Encore different? Nothing of note, coming off a significant freshening for model-year 2017. In fact, the next big change for this diminutive premium crossover SUV is slated for model-year 2020, when it’ll undergo a clean-sheet redesign. Encore was designed in Europe and is built in South Korea. It shares its basic engineering with the less expensive Chevrolet Trax. With upscale looks, refinement, and features, Encore occupies a fertile middle ground between mainstream and premium and has been a surprise hit since its model-year 2013 introduction. Demand continues to grow, with year-over-year sales up more than 16 percent through the first quarter of 2017. It’s Buick’s best-selling vehicle and America’s top-selling premium subcompact crossover. It also deserves some credit for igniting the premium-subcompact-crossover segment, which now includes the Audi Q3, BMW X1, Lexus NX, the mechanically similar Infiniti QX30 and Mercedes-Benz GLA, and the upcoming Volvo XC40. Part of Encore’s attraction is a starting price around $24,000, the lowest in the class. But trendy urbanites and empty nesters are also drawn to its tidy dimensions; friendly handling; quiet, upscale cabin; and easy ingress/egress with an SUV-like driving position. You probably shouldn’t. The 2018 Encore will almost certainly be a repeat of the ’17, so we wouldn’t delay a purchase in anticipation of any game-changing additions. We’d urge that Buick repackage some equipment — specifically, expanding availability of driver-assistance features — but that’s unlikely to happen before the 2020 redesign. Encore’s carryover-2018 lineup should again begin with the base model, called inelegantly, 1SV, and ascend through Preferred, Sport Touring, Preferred II, Essence, and Premium trim levels. All would come standard with a turbocharged four-cylinder engine and front-wheel drive. Traction-enhancing all-wheel drive (AWD) would be optional on all but the 1SV. If it fulfills your needs, definitely. Encore’s revised styling and additional features will sustain it to its ’20 redesign, so the ’17 will stay fresh through the end of this design’s lifecycle. Buying a ’17 would also help you avoid any model-year-’18 price hike, for what would be essentially the same vehicle. On that score, buying a ’17 allows you to take immediate advantage of the often-generous financial incentives offered by Buick-parent General Motors. As of April 2017, for example, most 2017 Encores are eligible for a significant cash rebate, some as much as 16 percent of the value of the sticker price. There are also several cut-rate financing and lease offers. No. It’ll continue with the updating styling that came on line for model-year 2017. The changes included a new grille, revised rear fascia, LED taillights, and a redesigned instrument panel with updated gauges and a larger 8-inch touchscreen infotainment system that gained support for Apple CarPlay and Google Android Auto. At just 8.3 feet bumper-to-bumper, Encore is one of the shortest vehicles on the road. But its tall build translates to excellent headroom front and rear. It also allows chair-like seating, so there’s actually livable rear legroom for adults of average build. Cargo space is tight for an SUV. But the 18.8 cubic feet behind the rear seat rivals the volume of a compact car’s trunk, while folding the seatbacks creates a handy 48.4 cubic feet. Frankly, you may need to get a bit clever if you take a lot of stuff with you. But the front-passenger seat folds flat, so Encore is capable of carrying items up to 8 feet in length. None expected. All models should reprise a 1.4-liter turbocharged four-cylinder engine and a six-speed automatic transmission. In standard form, expect horsepower and torque to remain at 138 and 148 pound-feet, respectively. Standard in the Sport Touring and optional for Preferred II, Essence, and Premium models will again be version of this turbo 1.4 with internal upgrades that yield 153 horsepower and 177 pound-feet of torque. The extra 15 horsepower and 29 pound-feet make the Encore feel noticeably quicker, while being only marginally less fuel efficient. Encore’s diminutive size makes it easy to maneuver in tight quarters and quite entertaining even on twisty roads – as long as cornering speeds are reasonable. All models share the same 18-inch tires on alloy wheels, as well as the same suspension tuning. And all exhibit a fair amount of body lean in anything more than moderate-speed turns. The tradeoff is a ride that’s remarkably smooth, given Encore’s short wheelbase (the distance between the front and rear axles). Just as attractive is the soothing lack of wind and road noise, a trait Buick cultivates and achieves in part with standard active noise cancellation. Probably not. EPA ratings for the 2018 Encore were not released in time for this report, but sans mechanical changes, they’re very like to repeat the 2017 ratings. With front-wheel drive, that means 27/33/30 mpg city/highway/combined for the 138-horsepower engine and 25/33/28 for the 153-horsepower unit. All-wheel drive adds about 120 pounds, helping to lower ratings to 26/31/28 mpg for 138-horsepower models and 24/30/27 mpg for the Sport Touring. 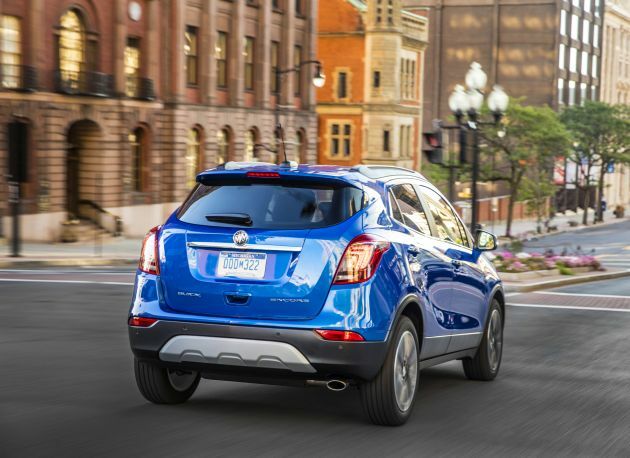 Note that the 153-horsepower 1.4-liter has fuel-saving stop/start that shuts off the engine when the Encore is stationary and restarts it when the driver releases the brake pedal. All models would use regular-grade 87-octane gasoline. Unlikely. The entry-level 1SV is a price-leader model, but it does have some nice standard amenities including the aforementioned active noise cancellation and CarPlay and Anroid Auto support, along with keyless entry with pushbutton ignition, 4G LTE connectivity that turns the vehicle into a rolling Wi-Fi hotspot, a power driver seat, rearview camera, and dual gloveboxes. The Preferred model has upgraded trim, a cargo cover, and the ability to add all-wheel drive. The Sport Touring has unique exterior styling cues, including a rear spoiler and integrated fog lights, as well as remote engine start. Moving to the Preferred II adds unique wheels, blind-spot alert with rear cross-traffic detection, and dual-zone automatic climate control. Essence models have LED headlights, leather upholstery, heated front seats and steering wheel, driver-seat memory, and a power front-passenger seat. The flagship Premium gains rain-sensing windshield wipers, front- and rear-obstacle detection, and a Bose-brand audio system. It’s also the safety-feature leader in the line, as the only Encore with lane-departure warning and forward-collision alert, which are standard. Unfortunately, that leaves Encore behind today’s safety curve. No other driver-assistance features are offered, leaving this Buick without increasingly common driver assists such as adaptive cruise control, autonomous emergency braking, and active lane-departure prevention. On the upside, Encore receives top marks in crash testing by the U.S. government and the influential Insurance Institute for Highway Safety (IIHS). But without the aforementioned driver assists, the Encore has been ineligible for the IIHS’s coveted Top Safety Pick status. They’ll probably increase marginally. Estimated base prices listed here include front-wheel drive and the manufacturer destination fee, which was $925 on the 2017 Encore. Expect AWD to again add $1,500 to all but the 1SV, which would remain front-drive only. And look for the 153-horsepower engine to again add $895 to the base price of a Preferred II, Essence, and Premium model. Estimated base price for 2018 Encore 1SV is $24,000. Estimated base price for the Preferred is $25,500, for the Sport Touring it’s $26,500, for the Preferred II figure $28,000, for the Essence expect $30,000, and for the Premium it’s $31,500. Other option prices should hold steady. Any paint color other than basic white would add $395-$995. Expect Sport Touring versions to again offer blind-spot and rear cross-traffic alert and embedded GPS navigation for $495 each, along with dual-zone automatic climate control for $275. The only other option group of note is the $2,390 Experience Buick Package for the Preferred II, Essence, and Premium. It would add a power sunroof, embedded navigation, and unique wheels. At what should be about $29,500, an AWD Sport Touring, with its upgraded engine and standard blind-spot and rear cross-traffic alert, is a compelling Encore choice. Also appealing is the AWD Essence with the 153-horse engine and standard leather upholstery, heated front seats, and heated steering wheel. But with a sticker price likely to approach $33,000, such an AWD Encore Essence is well into compact-crossover territory, where you can get a similarly equipped but much roomier Honda CR-V, Mazda CX-5, or Toyota RAV4. Estimated release date for the 2018 Buick Encore is during fall 2017. More, and more widely available, driver-assistance features, such as autonomous emergency braking and lane-departure prevention. Encore’s lack of these important aids doesn’t appear to have affected sales, but competitors that have them may start to steal more than few potential buyers. Buick should also make the more powerful 153-horsepower engine standard across the board. Its more potent nature more than offsets the minor fuel economy penalty.